To celebrate the top 30 PGA players competing in the final FedExCup event this weekend, you can buy $30 or more WGT Credits and get 6 free Callaway virtual golf balls. 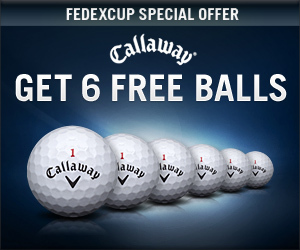 That's 6 (not 3) of the very popular Callaway Tour i(z) golf balls. Experienced WGT players know that these top-performing virtual balls are normally not unlocked until Level 35, but are available to any player buying $30 or more WGT Credits this weekend only. The FedExCup finale this weekend is the TOUR Championship held at East Lake Golf Club in Atlanta. Of the 30 qualifiers, any of the top 5 can win the FedExCup with a win in Atlanta, including Webb Simpson, Dustin Johnson, Justin Rose, Luke Donald and Matt Kuchar. Other top players with a chance include Jason Day (10th) and Phil Mickelson (14th). * One-time offer available to WGT players buying $30 or more WGT Credits 9/22-25/11 and will receive 6 free Callaway Tour i(z) (L35+) virtual golf balls. Check out the new hole locations on Oakmont, a new type of "Best Of" course, and latest best putter from TaylorMade. See details and other improvements below, and please keep the great suggestions coming to members@worldgolftour.com and on the forums. The new WGT "Best Of" courses are virtual mash-ups of favorite holes from different courses. The first "Best Of" combines 9 famous shots on 9 different courses, playable for free in closest-to-the-hole games or tournaments. WGT Players can vote for the next "Best of" course here! WGT has added a second set of hole locations on Oakmont. When you play Oakmont, lower Tiers will get an easier mix of locations, and higher Tiers will get a harder mix of locations, or you can choose just the new hole locations in a Practice round. Note, there are multiple hole locations on Bethpage and St Andrews too. TaylorMade has upgraded their top-selling Spider putter with a new all-white Ghost design for better aiming and superior precision on your putts. 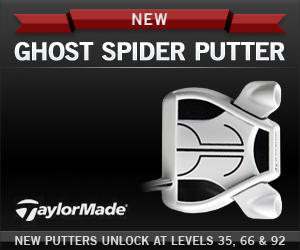 There are three new Ghost Spider putters that unlock at Levels 35, 66, and 92. Every day thousands of WGT players save their best shots in the game! Now you can see daily highlights of exciting hole-outs on the new WGT Replay page. Replays are updated twice per day so save your favorites and check back frequently. Watch short videos from LiveGamer and earn free WGT credits that you can use to upgrade your equipment and play in tournaments.